Reduces the appearance of wrinkles and fine lines;Increases the firmness of the look;Diminishes dark circles and puffiness. 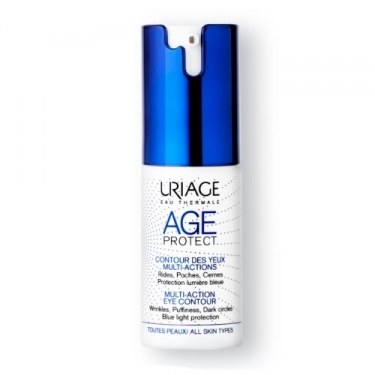 Age Protect Contour des Yeux Multi-Actions from Uriage is a gently textured eye care that acts on the signs of aging of the skin and on the daily aggressions that the skin is subjected to such as blue light, UV radiation, pollution, stress, fatigue, among others. Enriched with active decongestants and soft focus pigments, this care reduces the appearance of wrinkles, puffiness and dark circles, elevates the eyelids, thanks to its tensor effect, and smoothes the contour of the eyes. Apply morning/evening with gentle massage around the eye.